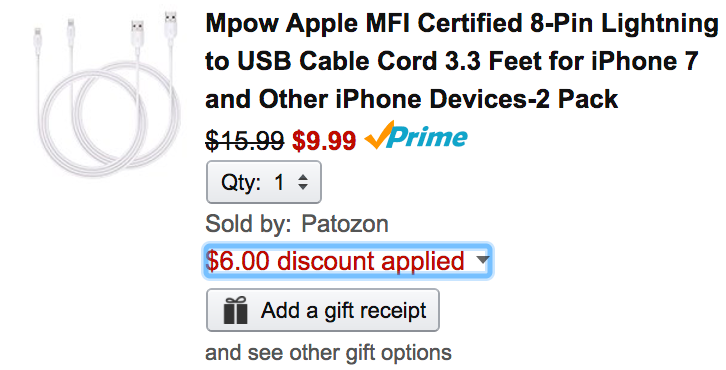 Patozon (99% positive feedback from shoppers) via Amazon once again is offering the Mpow MFi Lightning to USB Cable (2-pack) for $15.99, but if you use the code OFVYEPBB the price will drop to just $9.99 Prime shipped. That’s $6 off the sale price, a match to our previous mention and the lowest we can find for these Lightning cables. Each cable can be used to charge and sync your Apple devices and the compact head works with most cases. The cables are backed by a Mpow 18-Month Limited Warranty and rated 4.4/5 stars by over 170 Amazon shoppers. A Cable You Can Buy with Confidence: Each cable under bent test for 4000+ times, and 24 Hours Salt spray test, can support 10000+insert testing. MFi Certification Each cable contains a unique, verified authorization chip issued by Apple to ensure 100% compatibility with any Lightning device, and any updated iOS. Extra Cable Twenty-seven worker work for one cable and after forty-Seven Fabrication processing, then a apple cable was born. Fit Most Case The super slim Lightning connector head slots into virtually all case openings. Don’t be denied your case of choice by a bulky cable. Compatible Apple Models: iPhone 6 / 6 Plus / 5s / 5c / 5, iPad Air / Air 2, iPad mini / mini 2 / mini 3, iPad (4th generation), iPod Nano (7th generation) and iPod touch (5th generation).